Discussion in 'Bass Area; The Bottom Line' started by comicbookguy95, Feb 19, 2012. So for the past 3 years I have been using a Digitech multi effects unit for all my effects. Well it's time to retire it so I need to start building a bass pedal board. I'm a praise and worship player so most of what I need will be modulation type effects. I already have a tuner that I am pulling off my guitar board (Korg Pitchblack) and I will be buying a flanger (probably a BF-2) and a volume pedal ( Dunlop VP-1). What else guys? I know a lot about guitar effects but I'm kind of a noob at bass stuff! Thanks guys! See if you can get your hands on an HF-2 Hi band flanger. It affects only the high end and leaves your low end alone. Great for bass and has a nice unique sound. 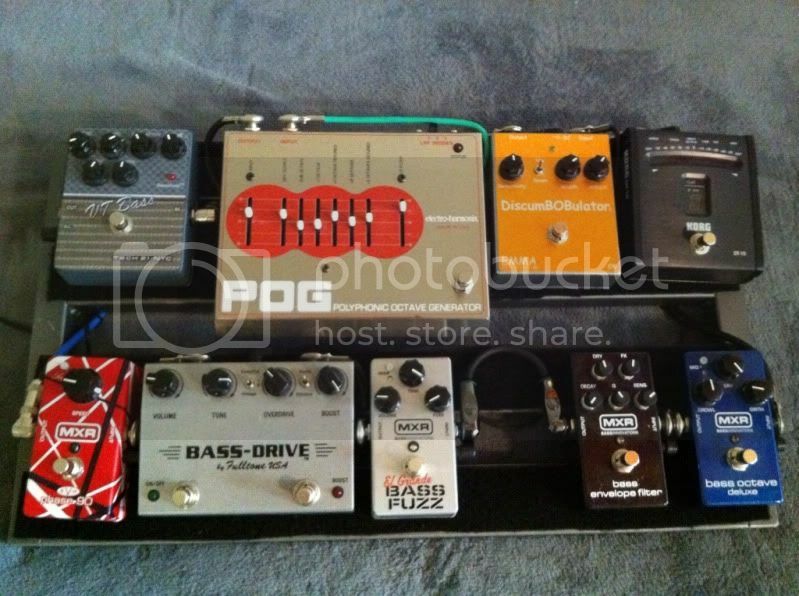 I also use a boss re-20, arion stereo chorus, russian big muff, BBE sonic stomp, Digitech bass synth wah, boss mega distortion, woolly mammoth clone and a byoc tremolo I built. There are good boutique offerings as well. 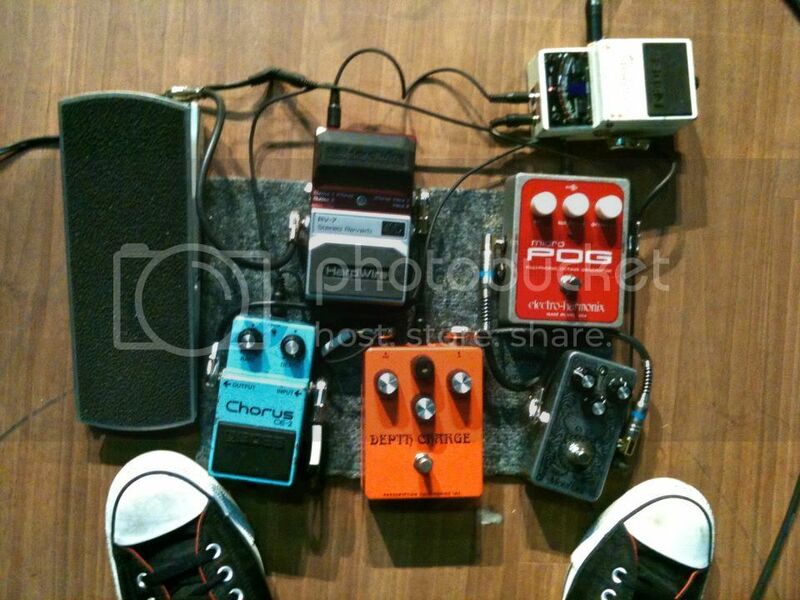 I've owned a number of highend pedals but the cheaper ones cover my bass with flying colors so they stayed. My board has an Octave, Fuzz, Chorus, Envelope Filter, preamp/EQ, and a tuner. You;d be surprised how often you use the octave. Mine is the MXR Octave down and I'll play stuff up high with it on. it adds a lot of fullness and sound killer with the fuzz. The octave pedal is an interesting idea. I'm getting a 6 string ibanez in may and plan on spending a lot of time in the higher range. Would y'all recommend the EHX MicroPog for an octave type pedal? Also what are good bass compressors? The mxr or the mark bass? Look into the Zoom B3; $200, three slots, small footprint- could work for you. I have a comp built into my TC head. The POG is nice and does a lot but the MXR I have does it's one job very very well. I've never owned a compressor pedal. Plenty of rack units but never a pedal. I might still go for the microPOG. I'm a guitar player as well and would like to "double shift" it between boards. Anyone else on compressor pedals? Micro POG is fun on bass too... try 'em all!!! I'd recommend trying out something subtle a lot of us bassists pay around with, like maybe BBE Orange Squash (Orange Squeezer type), or a good old Dyna Comp. Micro POG with the octave up not quite on full, slow modulation from the CE-2, RV-7 on Modulated Reverb on max for more ambience for quieter instrumental sections. With the Moollon Bass Drive and Prescription Electronics Depth Charge I have a huge amount of control over how much drive and fuzz I want, and with the other three I roll off the neck pickup (Moollon J-Classic) while picking and laying out chords a la Peter Hook. The McSqueeze was much missed, but I did alright.